I was thinking about the areas that we mess up in the most during this great month. What are the things that we could (and should) do that would help us improve our Ramadan? 1) We can (and should) sleep less. I beg to differ. I think that people snooze more in this month (or at least that’s what the people in this part of the world do) than they do outside of it. This is NOT the month of “catching up on our sleep”. 2) We can (and should) stop wasting our time with useless activities, and instead focus on our ibaadah (worship). Want to surf the Internet? Well, do it after Ramadan. Part of the reason that we waste our time is that we have deceived ourselves into thinking that fasting is only achieved by staying hungry and as we are staying hungry, we are in a state of worship. Well, no, there’s much more to fasting than just starving. 3) We can (and should) eat healthy food. Just stand in front of the mirror and repeat it a hundred times. Mass repetition is known to help the brain accept an idea, no matter how impossible it sounds. 4) We can (and should) stop fighting with each other in the masjid. Completely silly question: Is there any particular reason that we all single out Ramadan for masjid fights……..? 5) We can (and should) take it hour by hour and not think too far ahead. One of the main reasons that many of us flunk in Ramadan is that we go all out in the first few days and then fizzle out early. Instead, we need to take things step by step. Question to all of you (if you’re still around. Everyone seems to have disappeared? ): What other things are there that we can (and should) do in order to have a great Ramadan? Okay, the majority of you chose “Controlling the tongue as much as possible” as the second habit that you’d like to work on before Ramadan. 1) Be serious about achieving this goal. That should be obvious but many people are not serious which is why they fail! I always say this and I’m saying it again. Dua. Dua. Dua. Believe me, there is nothing like it. Ponder over the great virtue of those who control their tongues and also ponder over the many stories in the Quran and the Sunnah about the people that got thrown into Hell because of their big mouths. You know, we’re all humans so we all end up making mistakes. So no matter how hard we try, we will fall flat on our faces one day. Now, will we just stay there in that position? No, we will not. We will get up i.e. we will do istighfar (seek forgiveness) and make a fresh start, insha-Allah, even if we have to do this a thousand times. You know, when the person with us talks about good things, we too will feel like talking about good things. However, if the person with us talks rubbish, we too will eventually slip, let our tongues loose and start to talk rubbish. Controlling the tongue is one of the most difficult things to do, so we need to approach it on a daily basis. We need to do dhikr (remembrance) of Allah, dua (supplication) and say good things (e.g. enjoin good). If we don’t occupy our tongues with something good, then they will get occupied with something bad! We have been asked to stay away from vain talk. So, what is vain talk? A lecturer once pointed out that talking to your children (in a kiddish way) might appear to be vain talk but it isn’t because the whole point of the conversation is to build the relationship between you and your children. So, controlling our tongues doesn’t mean ignoring our children and not talking to them at all. It also doesn’t mean that we just stare at elderly relatives silently and make them feel uneasy instead of gently trying to talk about halal matters in order to make them feel better. It also does not mean that we be silent in the face of disobedience to Allah. Shaikh Saad Ash-Shitri pointed out (in his commentary to the 40 hadeeth of Nawawi) that good speech is better than being silent. So, not all talk is vain talk. Vain talk is that which does not bring us closer to Allah. 10) Remember that your tongue is a window into your brain. We talk about things that are on our minds so our tongues expose our thoughts. Let’s all ask ourselves: what is our speech like? Useful or useless? So, let’s try this for 14 days and see how it goes, insha-Allah. ….get you a house in Paradise and not in the Hell-fire. There are so many ahadeeth that warn us of the dangers caused by misusing our tongues. Everyone keeps complaining about not getting enough time to do more ibaadah (worship). Okay, what about at least remembering Allah with our tongues (e.g. saying Subhan Allah, Alhamdulillah, Allahu Akbar, Astaghfirullah, etc) while we drive, do housework, work on the PC, etc? At least this way we’ll keep adding good deeds to our hereafter bank account sand hopefully get a very pleasant surprise on the Day of Judgement , insha-Allah, when we see how many good deeds we have garnered. And don’t say that these are “little things”. Little things add up, remember? Yes, it might be a bit late for this but better late than never. Intentions – are they mandatory & should they be uttered? Innovations in the calendar! Fast begins at Fajar not 10 minutes prior. Backbiting – *eating* the flesh of your brothers/sisters. Brush teeth while fasting? Can we swallow spit?. Smelling perfume & tasting food? What can the menstruating woman do in Ramadan (apart from twiddling her thumbs, of course)? That’s what happens to many a woman when that time of month strikes her at this time of month. They think that Ramadan is over and start to twiddle their thumbs. I’ll try not to be catty today (at least not as much as yesterday). Yes, I’ll be Umm Muawiyah and not Umm Meowiyah. So, where am I headed with these reminders? The first few were on where we should be going (i.e. aiming for the top), the next few will be on where we are today (i.e. our totally sad state of existence) and the ones after that will be some practical tips on how we can go from being the losers that we are today into being the winners that we want to be. Doing istighfaar is something that is a trait of the true believers. The whole irony is that the more one increases in good deeds and decreases in sins, the more need one will feel to do istighfaar. And the more one increases in sins and decreases in good deeds, the less need one will feel to do istighfaar. 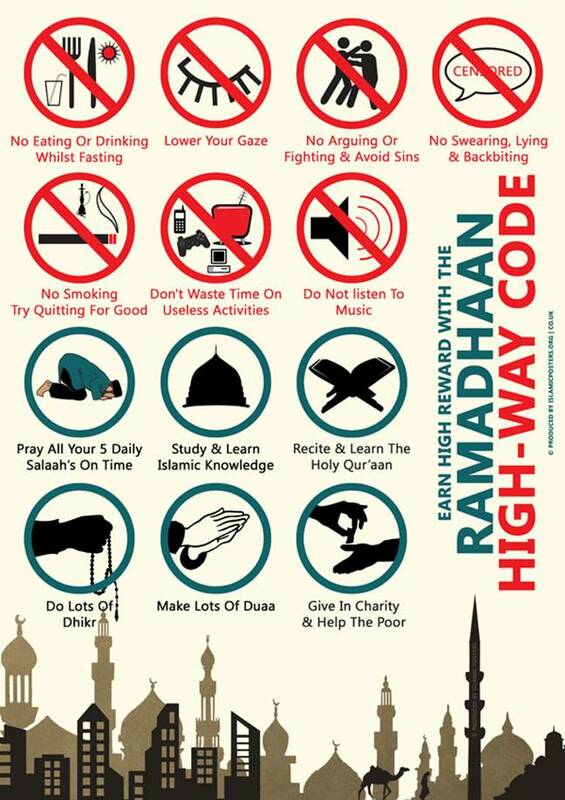 A friend of mine (you know who you are) sent me a cute flyer about Ramadan yesterday. [Note: They’ve shown a drawing of a hand using the dhikr beads (masbahah). One should know that there is an ikhtilaaf (difference of opinion) over the permissibility of using these beads. Some scholars said that they were haram because it was an imitation of the Christians and their rosaries (and a Hindu lady told me that Hindu priests use them as well!). Other scholars said that it was disliked, while others permitted it especially if one had difficulty doing the tasbeeh with one’s hands. (This is what I recall. Please correct me if I’m wrong). Firstly, the sunnah is to use the hands. The few ahadeeth that seem to imply otherwise are weak. Secondly, one should always strive to avoid doubtful areas. Why am I talking about backbiting in a blog about Ramadan? These nullifiers are haraam outside of Ramadan and fasting as well. It’s just that it is WORSE when you do them during fasting or Ramadan. Do you pray fajr (morning prayer) in the mosque in Jamaa`ah (gathering) every day? Do you keep all prayers in the masjid in Jamaa`ah? Did you read any portion of Allaah’s Book today? Are you consistent in saying your thikr (words of remembrance) and praise of Allaah and wird (regular daily dhikr) after every prayer? Do you pray all the regular sunnah prayers (supererogatory prayers) before and after the fard prayers? Were you humble and sincere in your prayers today, conscious of what you were reciting? Did you reflect upon death and the grave? Did you reflect upon the Last Day, its horrors and its perils? Did you ask Allaah (three times) to protect you from the Hellfire? Did you read any of the hadeeth of the Prophet, sallallahu `alayhi wa sallam? Did you consider keeping away from evil companions? Did you try to avoid excessive laughing and joking? Did you cry today for fear of Allaah? Did you say the morning and evening thikr? Did you seek forgiveness for your sins from Allaah for today? Did you supplicate to Allaah to keep your heart firm upon His Deen? Did you take advantage of the answerable periods (those during which supplications are answerable) to ask of Allaah?